So far, it seems that the comprehensive details of how the magnetic flux transitions are arranged on QIC tape using the QIC-24 standard, have been lost in the halls of time, and never made it to the internet, at least not in a complete way. 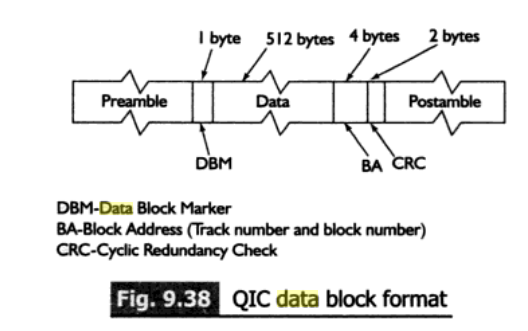 In my opinion, QIC.org should be the most likely to have this information, but they seem lacking in the QIC-24 (and QIC-11) department. 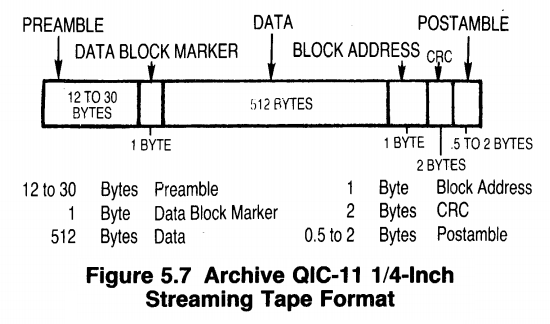 Well, I am hoping that this page will fill in a lot of the missing information about QIC-24 tape format. 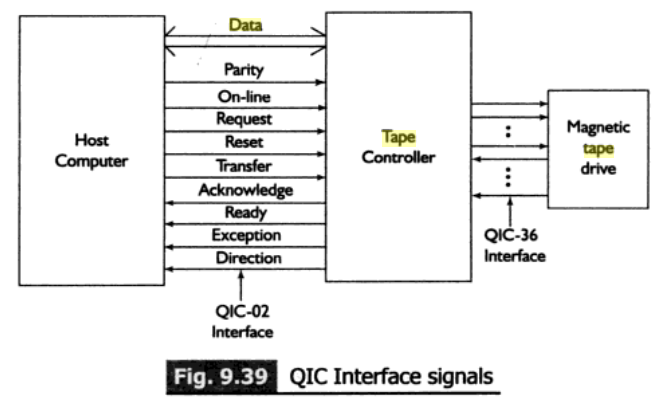 Before diving in, I wanted to clarify some of the "standard" terminology that surrounds this very mid-1980s QIC tape technology. I've tried to simplify the definitions, and I put them in my own words. 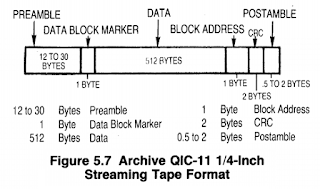 QIC-11 is a very similar, yet older, data read/write format, defined best by the below diagram. 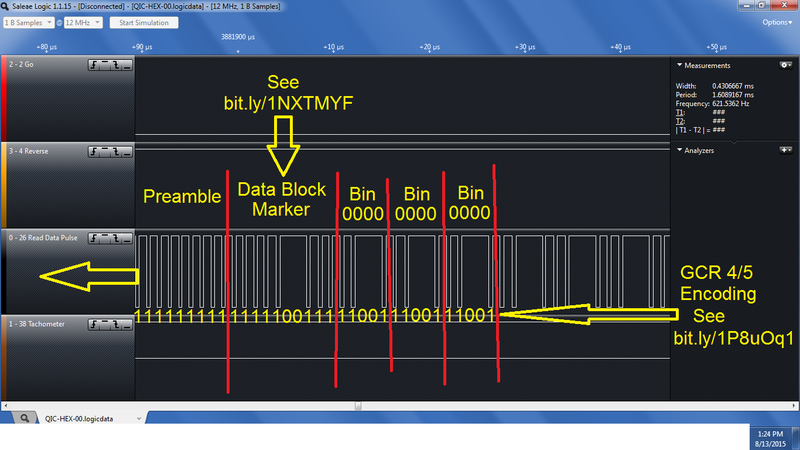 The main difference seems to be the block address size (1 byte vs 4 bytes on QIC-24). For this web page, we are focusing only on QIC-24 format, with the hopes to eventually also analyze the older QIC-11 format later. 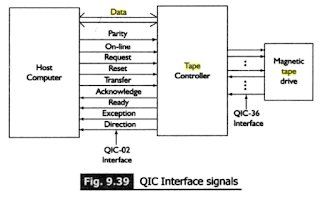 QIC-02 is a hardware interface, and is the interface that the MightyFrame motherboard (as well as many other vintage mini-micro systems from that era) uses to talk to the QIC tape drive assembly. 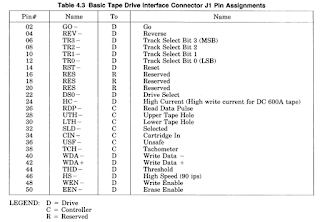 Therefore, a "formatter/controller" board must be present in between the motherboard and the QIC-36 interface of the actual tape drive. In the case of both the Archive 5945 and the Wangtek 5099, this controller board sits in the same "full-height" chassis as the tape drive, directly beneath it. 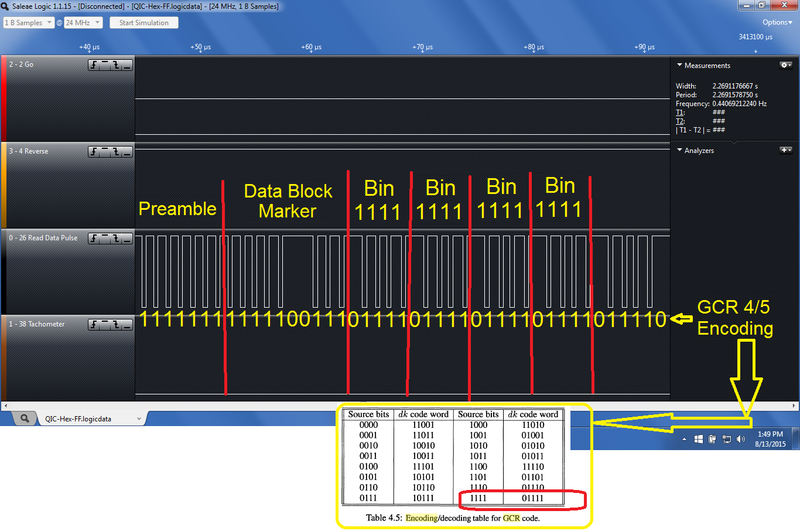 The analysis done on this page will focus on the QIC-36 interface, and just let the QIC-02 interface do what it does. 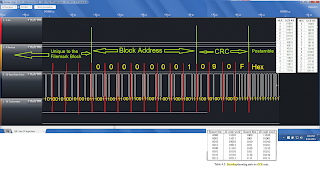 Please note, some have suggested that there is a SCSI interface involved here, but my tests have shown that the pinout for any of the interfaces do not match SCSI, even though they both use 50-pin connectors. Some formatter boards do interface SCSI to QIC-36, but not the ones I'm working with on this MightyFrame model. Instead, my tests have determined that I am dealing with QIC-36 and QIC-02 interfaces in this vintage of MightyFrame system. 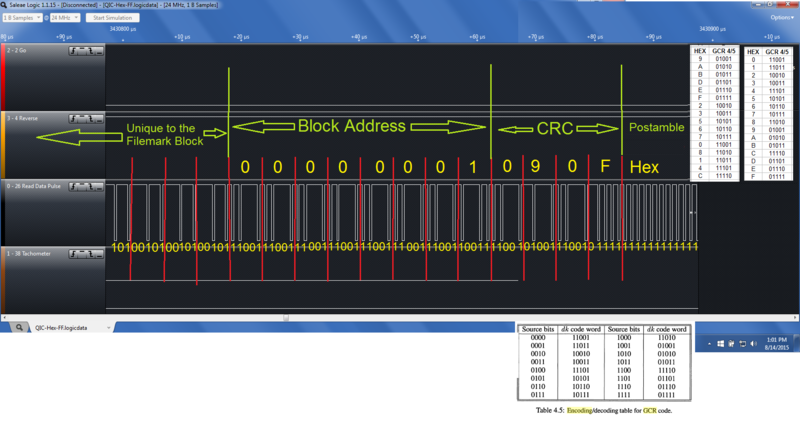 So, in order to read the data, I connected a Saleae Logic Analyzer to these pins on my custom-built QIC-36 diagnostic light indicator box. 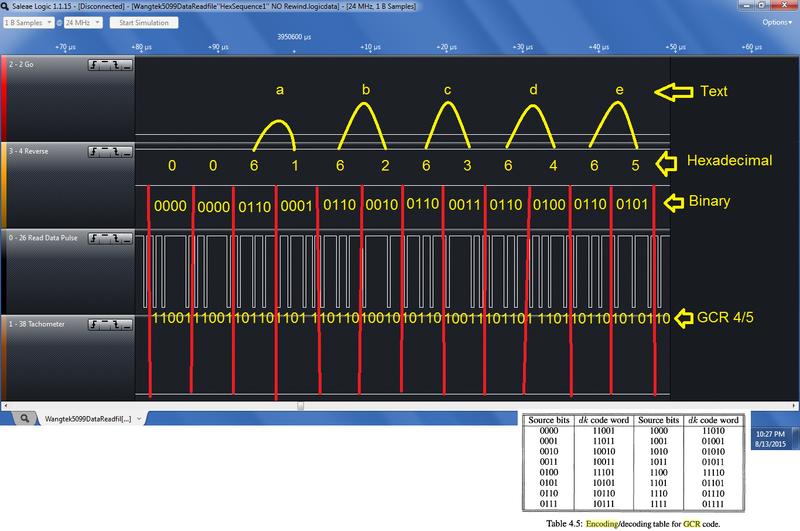 Here is a YouTube demonstration of reading a file with this custom-built QIC-36 diagnostic light indicator box. 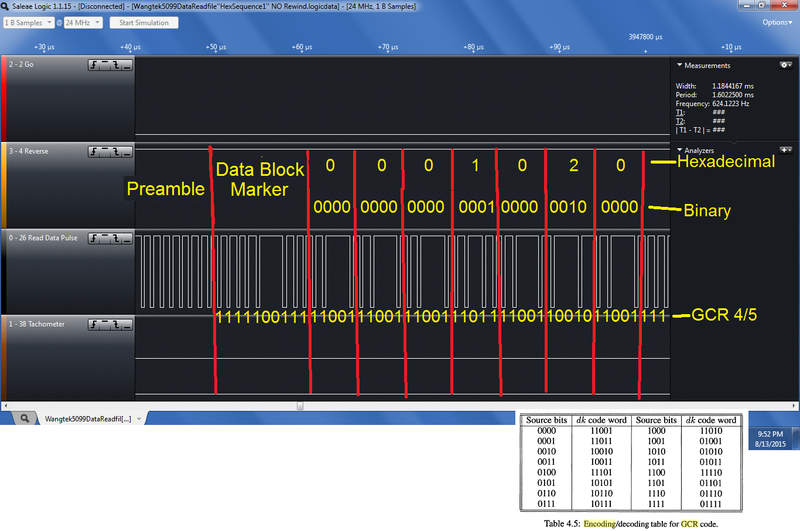 So, instead of using the Tachometer signal as a clock to synchronize the PLL for data reading, evidently the preamble does this. Elongated (3,500 to 7,000 flux transitions). This preamble preceeds the first data block recorded after an underrun. Long (15,000 to 30,000 flux transitions). This preamble precedes the first data block for interchange, recorded at the beginning of track 0. 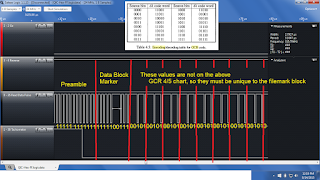 QIC-24 format evidently uses GCR 4/5 encoding....so what does that mean? 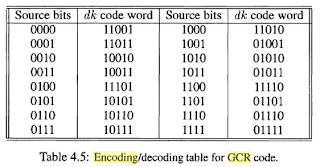 There seems to be more than one type of GCR 4/5 encoding. Commodore used one, but it didn't fit here. 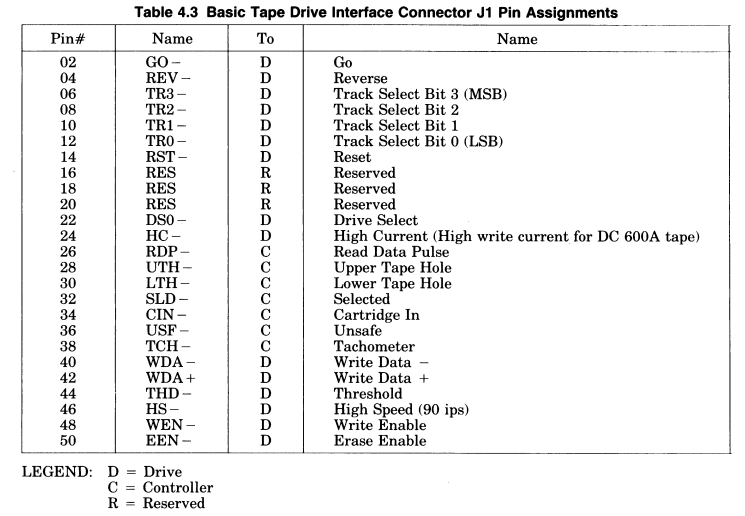 Instead, I found the source which gives a table for GCR code used in a "variety of magnetic tape drives". And, look at this! I just found it again in the Archive Scorpion 1/4" Streaming Tape Drive Product Description - March 1984, Page 5-4. Only there they call it 4-to-5 Run Length Limited (RLL). Note that NEITHER of these 5-digit codes exist in the GCR 4/5 table above? That's good to know that they're using unique characters. As you see below, however, the separation between the end of the preamble and the beginning of this marker was tricky to identify. The 512 data bytes (never more, never less) encoded as GCR 4/5. 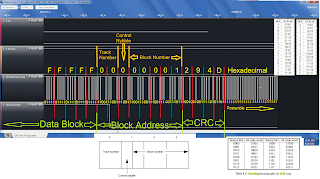 The block address consists of a 4-Byte block address with track number, a control nibble and block number starting with 1 on each track. 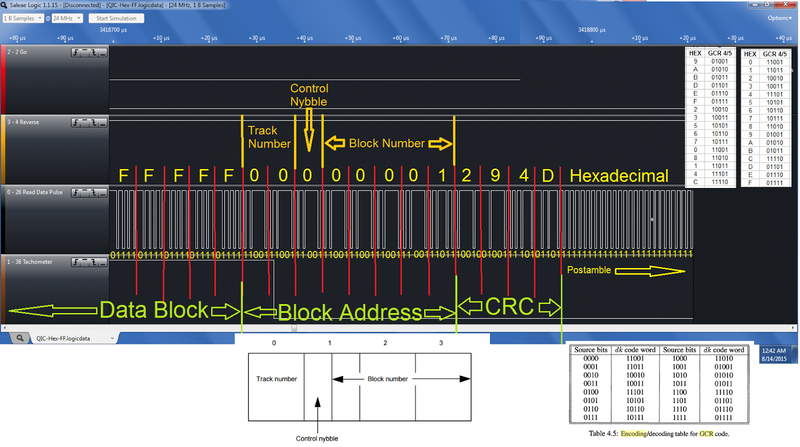 The text pictured below refers to the Control nibble within the Block Address, shown in the diagram above. The text pictured below refers to the Block Number within the Block Address, shown in the diagram above. So, I looked up some pages on how to use this polynomial to calculate the CRC, but I found it VERY confusing. It's not as simple as straight-forward algebra. I will likely dedicate a whole new page to an explanation on how to calculate this once I figure it out and test it. x16 + x12 + x5 + 1"
*"starting with all ONEs, CRC initial value"*? What does THAT mean? 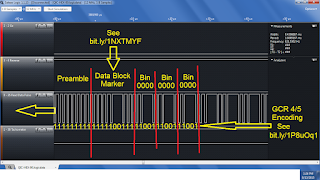 Prepending 84CF to the 512-byte data block and the 4-byte block address. It works! sequence, and then it works. Thanks, Lawrence! 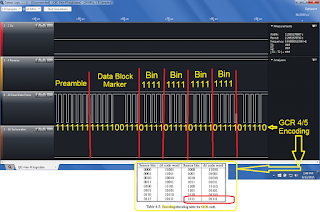 Now, for a simple online check, if I use this online calculator, and paste the data block + block address after the 84CF, I get the expected CRC. Thanks, Lawrence, Dwight, Chuck, and all who helped me understand how this works at classiccmp.org. A normal post amble of 5 - 20 flux transitions are recorded at maximum density to act as a guard band. Elongated post ambles of 3500 - 7000 flux transitions are appended when an underrun occurs. This means that the Postamble is significantly shorter than the preamble, especially the preamble before the first data block. I also had a mixed character/value source file, which I called "Sample1". I then wrote these files to a DC600 tape with a Tandberg TDC-3620 connected to a machine running modern Linux. 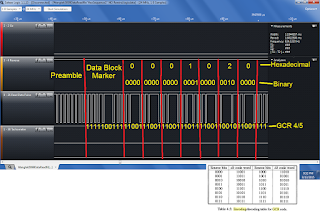 Then I did the Saleae Logic capture on each file, reading the tape with a Wangtek 5099, connected via the custom box I show in one of the videos above, to an Archive brand QIC-36 to QIC-02 "formatter/controller" board, which in turn is connected to the MightyFrame motherboard. I am providing downloads of all of the source files, as well as the .logicdata capture files from my Saleae Logic Analyzer on this Google Drive Here. So, armed with this information, and after much study, trial-and-error, and meeting with many VERY smart people who had some concept about how data was commonly read from magnetic flux transition on other 1980s computer peripherals, I was able to scroll through the Saleae Logic Analyzer capture file, and find the first block of data. And now it all becomes clear. Again, knowing exactly where these nybbles begin and end, and notice, once again, how the last one extends into what appears to be the postamble. So, just to make sure I had the codes right, I did analysis in the beginning of my "Sequence1" file, where I put ascending hex characters at the beginning. Then one quarter way through (half way through the first block), I put in alpha-numeric characters, starting with the alphabet lower-case. That's all the further I felt I needed to go to verify that I had this right. 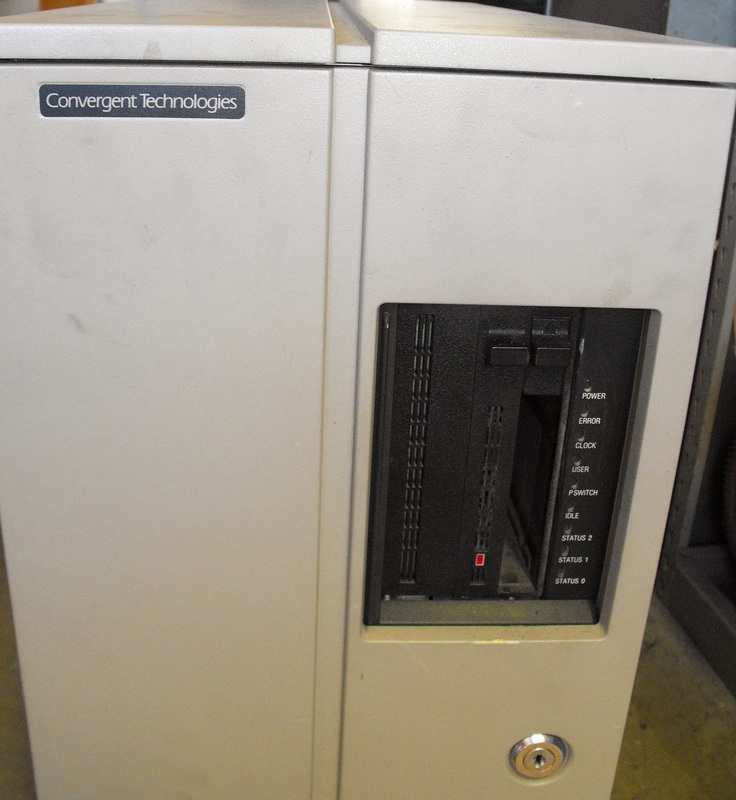 And, since I discovered that filemarks written by these tape drives were special codes that I could not replicate in data byte sets, I've always wondered what they looked like. Now I know. 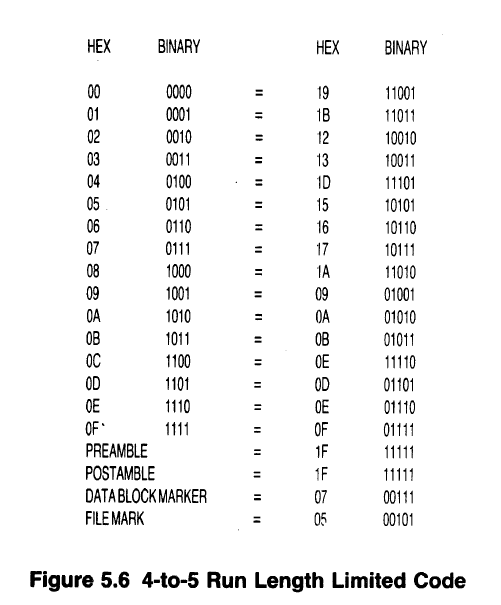 A filemark is a regular, yet special, 512-byte data block. 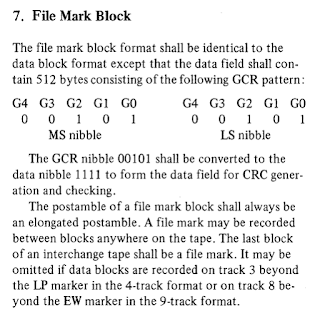 Notice how the nybbles found within the data block here are also, NOT found on the GCR 4/5 table. That's what makes them special, oh so special. And then I found this, which gives the most thorough definition of the "rules" of the QIC-24 filemarks that I've ever seen: File Mark Block. 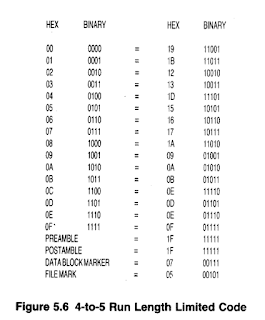 And, it goes on to say "The postamble of a file mark block shall always be an elongated postamble." Good to know. 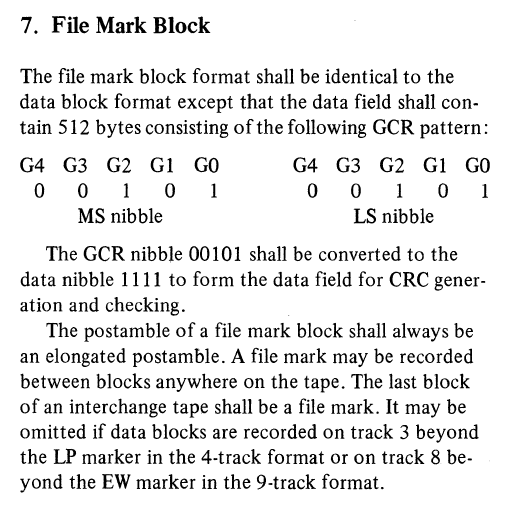 "The GCR nibble 00101 shall be converted to the data nibble 1111 to form the data field for CRC generation and checking." Even better to know, for when we test the CRC formulas. I still need to verify this, but I think that, if the data block prior to the filemark is the last one written on the tape (for the last recording session at least, not to be confused with any data previously on the tape but not erased after this point), that the MightyFrame system, as well as my modern Linux setup, writes 2 filemarks after each file, but then goes back and overwrites one of them if an additional file is written, ensuring that 2 consecutive filemarks indicates the end of data on the tape, while only one filemark indicates that the following block, since it is not a second filemark, begins the next file. Thanks for reading this! I welcome your feedback, comments, your own analysis findings, or whatever else you have to say about all of this craziness. Why would I do all of this analysis? Especially for 35-year old way obsolete data storage? Well, I have tapes that are both QIC-24 and QIC-11 that error out when read. But why? I mean, the system doesn't tell me that it's because the block is too short, or the CRC doesn't add up, or that 35% of the flux transitions are blank, or anything, and I want to know. Otherwise, what hope would I have of ever diagnosing and repairing any of the data on those tapes? Also, nobody has ever put a comprehensive guide to reading this vintage of tape to this level of granularity, on the web. So, it's my way of giving back to the vintage computing world and historical archives. Thanks to all of you who posted comments on this blog below. Would acquiring these documents help?